We all want to feel as comfortable as possible in our home, but the weather outside doesn’t always make that easy for us. It’s why we have learned to turn to thermostats to resolve that issue. These marvels of technology allow us to get the temperature just right in our homes, but not all of them are created equal obviously. In this article, we will look at the matchup: Ecobee3 vs Ecobee4 to figure out which of the two smart thermostats is most deserving of a place inside our home. Ecobee4 vs Ecobee3: Which Should You Buy? Where Should I Place the Smart Thermostat for Home Use? The Ecobee3 and Ecobee4 both excel as smart thermostats, but is one item clearly superior? Bottom line: Regardless of which item you choose, you’re coming away with a quality smart thermostat. The only real advantage the Ecobee3 has is a slightly better user interface. The Ecobee4 brings you a more functional Alexa, albeit one that still suffers from some issues. There’s no real reason to go out of your way to search for the Ecobee3, so if you like this company’s approach to designing smart thermostats, the product to purchase is most certainly the Ecobee4. The Room Sensors are the signature Ecobee features and you’ll be glad to know that they do their jobs exceedingly well. It’s nice to know that you can walk from one room to the next without worrying that you will have to adjust to the temperature first if you want to get comfortable. And that’s because the Room Sensors will do that for you. The Follow Me feature that comes with the Ecobee3 also saves you plenty of time, and it really does excel at keeping the temperature right where you want it to be. You can also expect the Ecobee3 to get an accurate read of whether you are or aren’t inside the home and it will then make the necessary adjustments based on the information it obtains. Unfortunately, the Ecobee3 does have a tendency to produce some inaccurate temperature readings because of its main sensor. It can be quite annoying to have the temperature changed by this item even when there is no need for it. You can address the issue easily enough and customer service is there to help, but still, a better functioning main sensor would have done so much for the Ecobee3. Overall, the Ecobee3 is a solid performer, but one that suffers slightly because of a faulty main sensor. The wireless Room Sensors that come packaged together with the Ecobee3 all perform their functions well. The user interface is easy to interpret and intuitive. It won’t take you long to get the hang of it. It won’t take long for the Ecobee3 to wise up to your preferences with regards to temperature and it will make the appropriate adjustments quickly. Should any issues emerge while this smart thermostat is working, you can expect to be informed of them right away. The Ecobee3 does an excellent job of understanding what’s going on inside your home, and it will also react in the way you programmed it to consistently. The main temperature sensor of the Ecobee3 can be unreliable at times. It’s an issue that can be fixed, but one that is annoying nonetheless. Ecobee3 works with Alexa, but it’s not a standout feature of this smart thermostat. We touched on how Alexa is kind of an afterthought in the Ecobee3 review, but the same cannot be said when it comes to Ecobee4. This time around, the manufacturers have decided to put Alexa front and center. The Alexa Voice Service is built into Ecobee4 and you can indeed ask it to perform a variety of tasks beyond just adjusting your thermostat. Alexa integration for more than a few other smart devices is certainly better, but it’s still nice to have a thermostat that can fulfill a variety of tasks. Included with the Ecobee4 are embedded microphones designed to help Alexa recognize your commands better, or at least that is the idea. In practice, the microphones have a tendency to struggle. You may need near perfect conditions to get Alexa to understand you on the first try. It’s a shame because they clearly invested in Alexa this time around, but the results are mixed at best. Though the Alexa integration will leave you wanting more, you’re still getting a really good smart thermostat out of the Ecobee4. It works just as well as the Ecobee3 and the Ecobee3 Lite for that matter. All the standout features of the previous-gen Ecobees are in the Ecobee4 as well. You’re paying for a thermostat most of all, and from that standpoint, you won’t be disappointed with the performance you will receive from the Ecobee4. The features you love from the Ecobee3 return in the Ecobee4 and they work just as well as they did before. 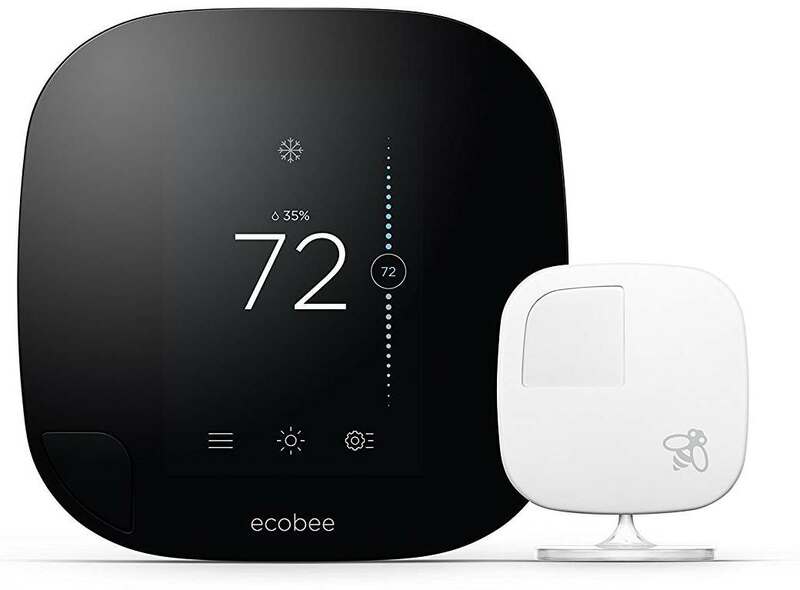 You are arguably getting a better deal with the Ecobee4 because it retains the main features of its predecessors while still introducing some new additions to make it more useful. It is easier to find the Ecobee4 on the market currently because it is the newer release. That should prove helpful if you’re jumping in late on Ecobee’s products. The idea behind increasing Alexa integration in the Ecobee4 is sound, and it works in a few ways, but the device often struggling to understand your commands right away is frustrating. The user interface may be tougher to read at times. Something you’ll see on both the Ecobee3 and the Ecobee4 is ENERGY STAR certification, and if you’re not familiar with that, rest assured that it is nice to have on both smart thermostats. Smart thermostats that have been given this particular certification are the ones deemed capable of saving you money while keeping you comfortable inside your own home. Feature sets for all ENERGY STAR-certified smart thermostats are not completely the same, but you can expect to find some similarities. For instance, the certified smart thermostat in question can likely be adjusted and controlled remotely using a smartphone. The thermostat may also receive software updates every now and then to ensure that it is able to operate at optimum capacity. ENERGY STAR-certified smart thermostats also often feature a geofencing feature. Thanks to this feature, the thermostat will be able to detect if the home is unoccupied and can thus adjust automatically to save you energy and money. The geofencing feature also allows the thermostat to adjust the temperature when it knows people are about to arrive so that they can be comfortable right from the moment they set foot inside the home. Lastly, ENERGY STAR certified-smart thermostats are also likely to possess the ability to pick up on your preferences with regards to the temperature of your home. The United States’ Department of Energy notes that a thermostat should be installed on an interior wall of the home that is not reached by direct sunlight or openings such as windows and doorways. Furniture should also be kept away from the thermostat. You should try to install the thermostat in a place where the air temperature and air flow is normal and consistent. Smart thermostats should also be located near the home’s router so that it can remain consistently online and ready for use. At the end of the day, the clear winner of the Ecobee3 vs Ecobee4 matchup is none other than the Ecobee4. 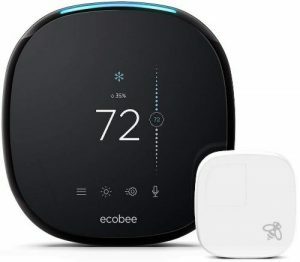 With pricing not really being a factor, the only other thing the Ecobee3 has going for it, as noted above, is marginally easier to understand user interface and that really isn’t enough to trump the added features included in the Ecobee4. Could Ecobee4’s Alexa benefit from some improvements? Absolutely. But that doesn’t mean it’s useless. You can still get some good use out of Ecobee4’s Alexa, and who knows, with time, maybe that feature of this smart thermostat can be improved as well.